Come and join our first Official InterNations Networking Event at Seven Sisters (JW Marriott Marquis). 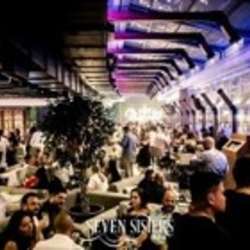 Nestling beside the Dubai Canal, Seven Sisters has it all; live DJs, live bands, impeccable food and a chilled atmosphere. The venue is inspired by the elements and represents every part of an oasis; the sun, moon, stars, sky, water, wind and flora. The elements have been creatively incorporated into each aspect of the venue, from the interior design to the food and bar menus and phenomenal live entertainment. Don't miss this amazing event and excellent chance to meet many new great people. Bring plenty of business cards for networking and the lucky draw - courtesy by Seven Sisters. Of course, you are more than welcome to stay beyond the registration period to enjoy the rest of the evening. The venue will be open until 3:00. Please feel free to bring along your friends/guests who you think can benefit from the InterNations networking opportunities. They can register at the door and pay a 60 AED entrance fee. Credit cards are not accepted to pay the entrance fee.